Instead of dragging the fill handle with the left mouse button you could alternatively drag it with the right mouse button. When you place the mouse over the fill handle and press the right mouse button you will notice that the cursor changes to an arrow (instead of a black cross). Dragging with the right mouse button (instead of the left) will display an additional shortcut menu. Fill Days - Continues by incrementing the value by 1 subsequently adding days to the series. Fill Weekdays - Same as Fill Days although only weekdays are displayed. Fill Months - Continues the series by adding months to the series. Fill Years - Continues the series by adding years to the series. Dates are just considered to be date serial numbers and are treated the same as numbers. The only difference being is that when you enter a date the format is automatically changed to the default date format "dd/mm/yyyy". You do not need to enter a sequence of days manually as they will be populated automatically. The days of the week are one of the built-in custom lists. Enter the text Monday into the cell "B2". Before you press Enter move the mouse position to the bottom right hand corner and drag the cell down with the left mouse button down to cell "B8". You only need to type in the first value when the sequence has been saved as a custom list. It is also possible to automatically populate just the weekdays excluding Saturday and Sunday. Before you press Enter move the mouse position to the bottom right hand corner and drag the cell down with the right mouse button down to cell "B8". A shortcut menu will appear allowing you to select "Fill Weekdays". You do not need to enter the days or the months manually as they can be populated automatically using the Auto Fill. Dates work in exactly the same way as numbers since they are just stored as serial numbers. Enter the text "Jan" into the cell "B2". Before you press Enter move the mouse pointer to the bottom right corner and drag the cell down with the left mouse button to cell "B13". You will notice that the value that will be placed in the cell is displayed as a tool tip. You don't need to enter a sequence of dates manually as they can also be populated automatically. Enter the date "01/07/1977" into cell "B2"
Before you press Enter move the mouse pointer to the bottom right corner and drag the cell with the left mouse button down to cell "B8". There are four custom lists saved as default, two are for days and two are for months. 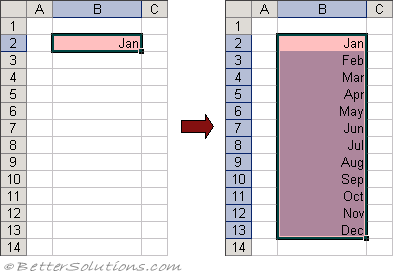 How the actual dates are displayed will depend on the number format applied to the cells.